A New-York Historical Society historian examines the impact of 20th-century newspaper columnist and women’s self-help guru Marjorie Hillis (1889-1971). Hillis first entered American consciousness with the 1936 publication of her bestselling book, Live Alone and Like It: A Guide for the Extra Woman. Then single and living and working in Manhattan, she exemplified the glamorous “Live-Aloner.” Scutts suggests that Hillis achieved fame during this time because the Depression had opened a space of “possibility and promise” for working women, who saw old certainties about marital security collapse with the economy. Combining the positive-thinking approach espoused by such self-help writers as Norman Vincent Peale and Dale Carnegie with a sharp eye for home and personal style, Hillis helped single women see their solitary ménages as spaces for “creativity and reinvention.” By 1939, she disappeared from the cultural scene into a happy marriage. During the 1940s, women had the opportunity to become an important part of a wartime economy and feel independent as never before. Hillis became a widow in 1949, just as the United States entered a period when the new gender ideal for women emphasized domesticity and subservience to husband and family. Working very much against cultural trends, Hillis published another book, You Can Start All Over, in 1951, which encouraged mature live-aloners to take pride in their accomplishments and to continue engaging with the world through work and other social activities. While the feminist movement of the 1960s challenged the cultural backlash against women, Hillis wrote Keep Going and Like It (1967), which offered retired single women advice on continuing to take pleasure in the world on their own stylish terms. 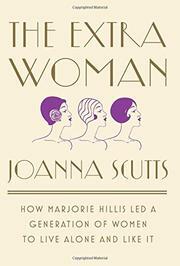 Rich in historical detail, Scutts’ book is not just an elegant biography of a neglected protofeminist figure and a vivid exploration of American sociological history; it is also an important homage to a woman’s right to choose how to live her life. A sparklingly intelligent and well-researched cultural history.